Join me and discover the fast, fun way to bring disappearing blocks to life. Dive in with 5-inch pre-cut squares and the disappearing nine-patch quilt block as I guide you through cutting, sub-cutting and piecing your way to stunning results. Then, learn to create captivating color contrast as you sew disappearing four-patch and diagonal four-patch blocks. 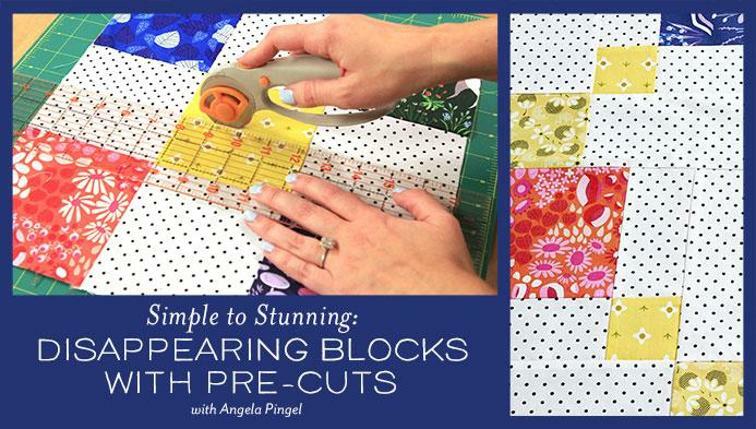 Apply the techniques you’ve learned to transform 10-inch pre-cut squares into striking pinwheel and hourglass blocks, then make the switch to eye-catching pre-cut strip designs. Double your fun with my breathtaking double disappearing nine-patch and sew a whimsical whirligig block that looks paper-pieced but is a breeze to create. By the end of class, it will take you just a few minutes to finish blocks that look like they took hours to sew!